100% natural pure essential oils. Simple steps to feel your best. Suitable for vegans.Looking for an escape route from your hectic life? 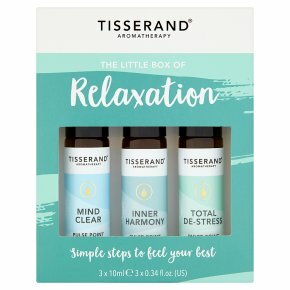 Take a breather & enjoy some calm with our relaxing pulse point roller balls made with 100% natural pure essential oils. Mind Clear blend of Peppermint, Lavender & lemon allows you to declutter your mind & find clarity. Inner Harmony blend of Frankincense & Geranium brings a sense of balance & a moment of contentment. Total De-Stress blend of Geranium, Orange & Nutmeg helps you to slow things down & breathe. Relaxation Ritual: Roll onto pulse points at the temples, neck and behind ears. Can also be used on the wrists. SAFETY INFORMATION: For external use only. Avoid contact with eye area. Do not ingest. Discontinue product use if there is any redness or itching.